…little BITS of our lives. Hi again! 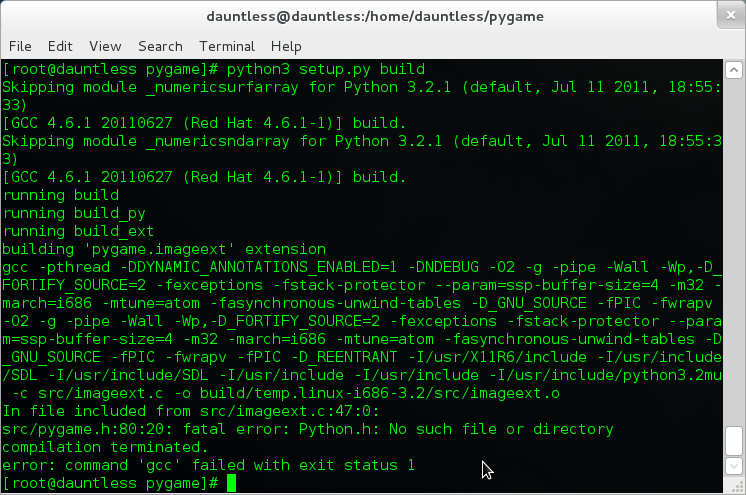 This time, a friend of mine asked me to install pygame on his fedora machine to work with python3. Now I don’t have much experience with fedora, but I kinda liked it in the little time I have used it. Anyways, coming back to the topic, this installation, took my entire afternoon, so I decided to make a post about it. Fedora is shipped with python2 installed already, so the first thing is to install python3. Now since you are reading this, I will assume you already have python 3 installed. What you should do is also install the ‘python3-devel’ package. Why? Once you are done, we have to install all the dependencies for pygame. These are basically some libraries, some of which might be present in your system already. This will install the dependencies that you need in order to install pygame. Now, what we need to do is acquire pygame. You can do this by any method, for example by downloading the zipped file from the pygame website and then extracting it into your computer. I prefer the method of acquiring pygame through ‘svn‘. Unfortunately, svn might not be installed on your computer. So, you can stick to other methods or ‘install svn’ :D.
Now go and acquire pygame by typing this into your command line. The download will begin in a moment, you will see a bunch of text appearing and then when the prompt comes again, move to the pygame folder. New Beginnings, New Learnings, Old Blog, Old Blogger! Gives me a nothing to do error. Is this the correct install command? Hi! Sorry for the late reply. Hope u already solved your problem. But ‘nothing to do’ message is not an error. It just means that u already have all the packages that get installed with that command. I would recommend that you try the next steps, and if it still doesn’t install, feel free to post your log at some place where i can look at them. (For ex: imagebin.org). i wanna install pygame on Fedora 17.
it’s possible with this tuto? Although I haven’t tried it myself, I believe it will work just fine with fedora 17.
archetypechris, above mentions he got it working :). Nyway, if u run into any problems feel free to tell me and I shall be happy to help. This is after creating the symlink mentioned in thist post. Do you have any ideas?